Many people focus on shredding fat and gain hard lean muscle without losing or gaining weight. In order to achieve that you should focus on strength workout beside a low carb diet. Fat burning without muscle loss is all about rich protein intake. Low carb diet can provide you with enough protein that is required for building and maintaining muscle. Moderate strength exercise plays a vital role to increase your muscle mass and tone it. Also, low-intensity cardio for 15 minutes during your strength workout will increase fat burning and tone your muscle. During shredding out you may suffer from some hunger feeling due to your active metabolic state. 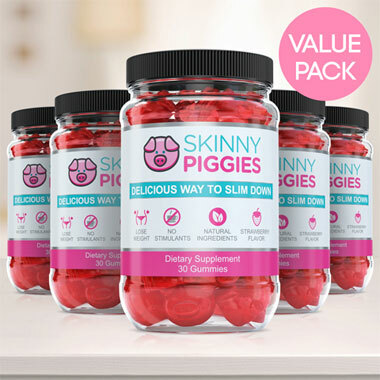 Skinny Piggies gummy supplements would be helpful to fight hunger and craving. Take one gummy can be taken with a full glass of water 30 minutes between meals. Who Else Want to Lose Weight with These Tasty Slimming Gummies? Do you love snacking on delicious treats but also want to lose some weight? Now, there's a new weight-loss product that allows you to snack guilt free. 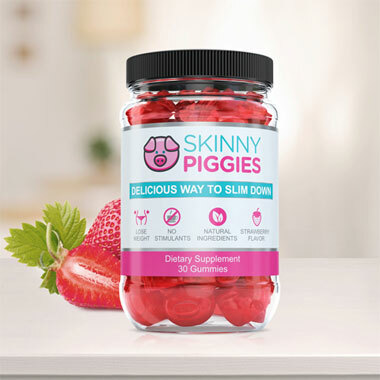 Skinny Piggies delicious diet gummies are created to help you combat cravings and will keep you feeling more full, all while promoting weight management. The key for slimming down means consuming fewer calories than your body burns. Unfortunately, that usually results in being hungry all day long. is not a rocket science: Consume less calories than you burn daily and you will start losing weight. But once you start cutting back calories, and hunger becomes difficult to control. This is where Skinny Piggies Diet Gummies come into play! These tasty appetite suppressants are created to not only help you fulfill those cravings, but also help you to stick with your diet by helping you feel much less hungry. Hunger is for the most part driven by: caloric consumption and the feeling of food in the stomach. After you eat food, your stomach gets full and the food stretches it. That creates the sensation of satiety and you stop eating. When you eat one Skinny Piggy just twenty minutes prior to your lunch with a 16-ounce glass of water, it will expand to a gel, stimulating receptors in your stomach, letting the brain know you just ate a lot of food. With this, when you do eat, you're already partly full and eat fewer calories because of it. That means you can lessen desire to eat and food cravings, hunger, and keep your caloric intake down, all without being starving most of the time. The gel also enables the stomach to empty slowly and that makes you feel full for a longer period. The longer you are satisfied, the less likely you will remain to eat that allows you to eat much less calories. As the liquid gel surrounds the food, it slows down the digestion of sugars which normalizes your blood sugar level. By preventing sudden changes in your blood glucose level you stop those pesky cravings too. When you eliminate blood glucose spikes by slowing down the absorption of carbs you are stopping it from being stored as fat and that then triggers your body to burn its stored fat. The slower the intake process the longer you remain in fat-loss mode. No Chemicals or Stimulants: Taking a dietary supplement with no harsh caffeine and that's why you can take them even in the evening. 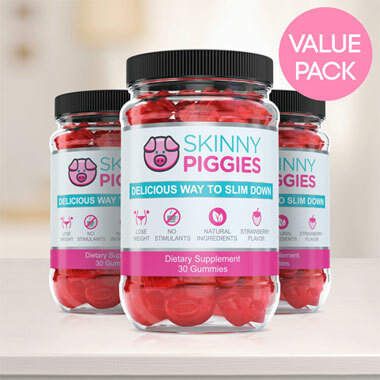 Genuine Ingredients: Unlike most weight loss supplements, it's easy to pronounce all active ingredients in Skinny Piggy gummy supplements, so rest assured that you're filling your body with only high quality ingredients. Yummy Flavor: Very few gummy supplements taste good, and none of them have the same delightful taste of strawberry gummies, and that means these gummies are a pre-meal treat you'll look forward to. Nutrient rich Nutrients: In addition to helping you suppress your appetite, they also help the growth of healthy hair and help your skin looking younger. You will really love eating them so remembering to take your dietary supplement will not be an issue. They are delicious and anyone can get going right off the bat. Try just one gummy and we're sure they will become a highlight of your day.